On my first full day in Coron, I realized I had absolutely nothing to do. The dive company I was supposed to dive with was already fully booked for the day, so I had to wait to dive until the next day. I figured I would lay out on Coron's beach and read, but then I found out Coron doesn't really have a beach. You have to go island hopping to see all the beaches. I had been so focused on my diving plans for Coron that I didn't even know island hopping was a thing here, but it definitely is! 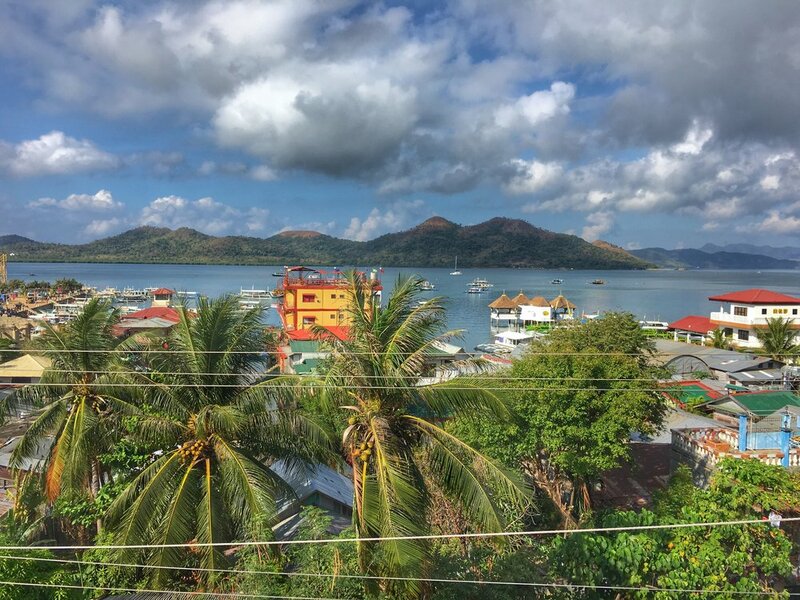 During breakfast that morning, which was set on a beautiful terrace overlooking the ocean, I asked a few other backpackers if they had any advice on how to get on an island hopping tour. By 8am, many of the tour company boats had already left, but one of the girls told me I could go down to the dock and try to join up with a group who might be looking to hire a private boat. I grabbed my sunscreen, sunglasses, and GoPro before I hurried down to the dock. It was already 8:30am and I wasn't really sure what to look for… honestly I was just hoping to find some other backpackers like me. After not seeing very many people, I started walking back towards the market on the dock. A Filipino guide then came up to me and asked, "You looking to join boat?" "Yes!" I said. And that's how I met Ashreen and Sundeep! They had planned to meet up with two other people for a boat tour, but the couple had bailed. We spent the next half hour looking for another lonely backpacker who might be able to take the fourth spot so we could drive the cost down. And that's how we met Goran! After negotiating the size of the boat (the first boat was way too small), we finally ended up with a good sized boat and a crew. The boat's captain, guide, and deckie joined us. Our guide, RJ, took us to the market first and we picked up chicken, rice, soy sauce, bread, mangoes, and bananas for lunch. By 10am, we were settled on the boat and made our way to our first stop, Siete Pecados. We snorkeled around for a bit, but we only stayed here briefly. Some of the coral had been destroyed by a typhoon awhile back, so there wasn't too much to see. Our second stop was Barracuda Lake, which is a pretty unique lake. To get to it, you have to climb up and down 20 steps, which doesn't sound like much, but these are the shoddiest steps ever created. Whoever threw these boards together to make steps was drunk. But once you make it over the other side, the rock formations are stunning and the water is so clear. Barracuda Lake is actually a mix of fresh and salt water, and it is quite warm. We snorkeled for awhile looking at the different rock formations. When we finally pulled ourselves back up onto the pier, we realized we were crashing a Filipino TV show! There was a whole crew crammed onto the little pier, complete with a mic, video camera, lighting, and a drone. Once we started talking to the crew, we learned that they were filming for a beauty show called Belo Beauty 101. Apparently, Belo Beauty is a very famous cosmetology brand here in the Philippines, and they film in different locations as they feature patients who have undergone cosmetic surgery. The crew even gave me some Belo brand products! Then we went to Twin Lagoons, which we ended up staying at for awhile. We loved goofing around and dancing to Filipino techno music, which the locals love. It's like English songs that have been remixed into Tagalog with a really heavy techno beat -- it's kind of funny. Since we had left late, we also had most of the islands and beaches to ourselves. It was so nice to experience these places without the massive tourist crowds, which had already come and gone for the day. We had such a good group on the boat. It was awesome that it was just us four, plus our crew. Ashreen and Sundeep were the couple from Malaysia; Ashreen is a dental student and Sundeep is a dentist. I was excited to get to know them because I'm going to Malaysia in two weeks, so Sundeep gave me a list of things to do in Borneo. Even though we teased Sundeep for being an "Instagram boyfriend" (the poor guy had to take hundreds of carefully posed photos of his girlfriend! ), they were really a great, hilarious couple and a blast to be around. Goran was from Sweden and -- get this -- is a full-time poker player. He did all the math for us when it came to figuring out who owed what and how we could get the best deal on the boat. Goran and I ended up grabbing dinner after the boat tour and I learned so much more about poker than I thought possible. I know I sound like a broken record, but what I love most about traveling is all the amazing people I get to meet. How awesome is it that I woke up with no plans and then ended up on a private boat tour with two dentists and a poker player?! After Twin Lagoons, we had a late lunch at Banhol Beach. It was already 2:30pm and there were no tourists around at that point. We had the beach to ourselves! The boat crew cooked our lunch for us, and we enjoyed chicken, rice, mangoes, and bread right on the beach. We couldn't bring ourselves to leave and stayed there for nearly two hours before the guide said we had to get back by 5pm. 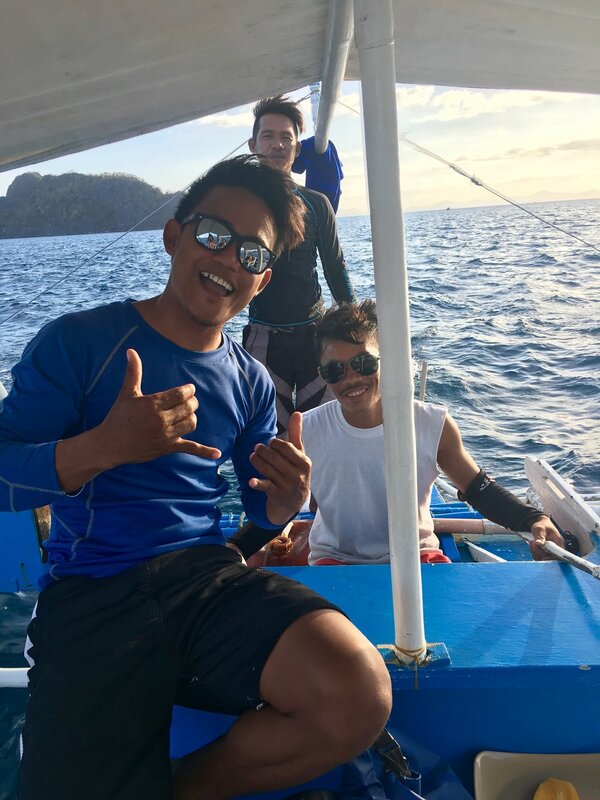 I loved island hopping all over Coron, dancing to silly techno music with the boat crew, soaking up the sun with new friends, and snorkeling in such pristine waters. 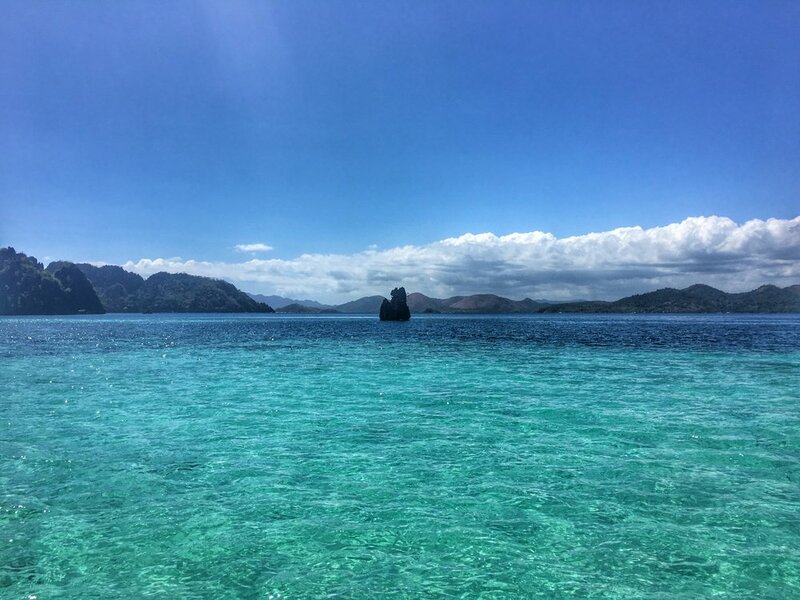 It was an amazing way to take advantage of the two days I had in Coron. Up next? Diving! Great place right in the middle of town! Private bathrooms and showers, excellent free breakfast on a terrace overlooking the ocean, and very friendly staff. 500P / $10USD a night. Going to the pier and organizing a private boat tour is less expensive (and way more enjoyable) than going with an organized tour group, which is 1,600P / $31USD a person. If you go: Check out Brujita's for great vegetarian dishes and a chilled-out atmosphere.